Ready for some bright, tangy flavor? Just dish up the Salsa Verde. This dish, which is made with tomatillos, takes just minutes to whip up. It’s equally good at room temperature or chilled, so you can prepare a batch at the last minute while you’re grilling meat or fish. Best of all, it will turn your next ordinary meal into a fiesta. Salsa is great with raw veggies or chips, of course. But we also find it makes an enticing sauce for grilled meat, poultry, and fish. Tomatillos are the backbone of Salsa Verde. If you’re not familiar with them, they’re husk-wrapped small green globes that look a lot like green tomatoes. You can make Salsa Verde without roasting the tomatillos, but we like to roast because it deepens their flavor. We pan roast the tomatillos for this recipe, but in the Notes we provide instructions for roasting them in the oven, boiling them, and even using them raw. Chile peppers also provide major flavor in this dish. We like to use jalapeño peppers because we love their flavor (and they’re always available at the supermarket). If you want a hotter pepper, you could try serranos. When Hatch chilies are in season, they also make a wonderful addition, as would Poblano peppers. (We like to roast both of those before using.) We specify about a quarter cup of chile peppers for this recipe, but that quantity is very much subject to taste – use less or more, depending on your tolerance for chile heat. Prep time for this dish is about 15 minutes. You can serve it immediately or refrigerate it in an airtight container for an hour or two. This recipe makes about a cup of sauce. Remove the papery husks from the tomatillos. Rinse and dry the tomatillos, then cut them in half. Place the tomatillos cut-side down in a large skillet (preferably nonstick). Peel the garlic cloves and add them to the skillet. Place the skillet on medium stovetop heat. Roast the tomatillos uncovered until the cut sides are well browned (4 or 5 minutes). Turn over the tomatillos and garlic and roast them for another 3 to 5 minutes (until everything is well browned, and the tomatillos are softened). Remove the skillet from the heat and add the contents to a food processor or blender. Allow the tomatillos and garlic to cool to room temperature in the food processor. Meanwhile, wash the jalapeño peppers and cut them lengthwise. Use a teaspoon to scoop out the ribs and seeds (be careful, the oil on these is hot; keep fingers away from your eyes). Chop the jalapeños roughly and add them to the food processor. Then wash your hands with soap and water to remove the hot jalapeño oil from your skin. Wash the cilantro, chop it roughly, then add it to the food processor. Pulse the food processor until the ingredients form a coarse purée. Add water to thin the mixture slightly, then pour the contents of the food processor into a small bowl. If using the onion, cut it into fine dice and add it to the bowl. Mix in. Add salt to taste, and additional water if needed, then mix well. How long should you pulse the salsa in Step 6? That depends on what sort of texture you prefer. Pulse longer for a very liquid texture, less for a chunkier one. If you want to make the salsa more than an hour or two ahead of time, we suggest preparing it through Step 4. Skip Step 5 (adding the cilantro), and instead pulse the tomatillos, garlic, and jalapeño pepper as directed in Step 6. Refrigerate the mixture. When ready to serve, chop the cilantro (and onion if using), and stir them into the salsa. Why do it this way? Because the flavor of cilantro and onion is much better when they’re fresher. Some people like to add lime juice or vinegar to Salsa Verde. If you’d like to try this, start with a tablespoon or so. If you add too much lime juice or vinegar, a touch of sugar will help tame the tart flavor. Sugar can also help mask hot spicy flavors. So if you’ve added too much jalapeño pepper, a bit of sugar will help with that too. To oven roast tomatillos: Husk and wash them, then cut them in half. Place them cut-side down on a baking sheet (we usually line the sheet with foil for easier cleanup). Place the baking sheet under the broiler for 5 minutes or so to blacken the skins of the tomatillos. Then proceed with the recipe. To boil the tomatillos: Fill a 4-quart saucepan half full with water, then bring it to a boil. Add the tomatillos. Simmer for 5 minutes, then drain the tomatillos and proceed with the recipe. You can also skip cooking the tomatillos altogether and make Salsa Verde Cruda. Just husk and wash the tomatillos, then add them to the food processor and go from there. This is the fastest version of all (you can mix up a batch in about 10 minutes). As noted, you can use almost any green chile pepper when making this dish. Most cooks probably use jalapeño peppers, but feel free to experiment with other chilies (or a mix of peppers). We use kosher salt for cooking. It’s less salty by volume than table salt (because it’s coarser). If using regular table salt, use about half as much as we suggest. But, as always, season to your taste, not ours. Once you know how to make one salsa, you essentially know how to make them all. You need a base ingredient (tomatillos in this case), an aromatic (like garlic, onion, or shallots), a fresh herb (cilantro in this case, but parsley and mint also work), usually a bit of acid to balance the mixture (we don’t use acid in this case because the tomatillos are rather tart, but it’s common to use lime juice or vinegar), a “ping” ingredient (jalapeño peppers in this case), and salt (plus sometimes black pepper) to add the final tone to the dish. “Of course, our Strawberry-Chipotle Salsa with Jalapeño may be our hottest stuff,” I said. “And berry good it is,” said Mrs K R.
“Nice to have so many spicy salsa choices,” I said. The new market near my home, which sells locally-grown produce, currently has tomatillos for sale. I should take this recipe very seriously!! Hi Mae, you should! This has wonderful flavor. :-) Thanks for the comment. Really insightful posts and nice of you to share the recipe. Greetings! Hi Blogoratti, it's good stuff -- hope you have a chance to make it. Thanks for the comment. Tangy flavor!! count me in. All my kids love salsa and I think they are going to love this as well. Great recipe. Thanks. Fantastic looking salsa verde. So true roasting make a massive difference. Charring the jalapeño would bring even more depth. Alas tomatillos are hard to find in my neck of the woods, well uncanned ones. But sometimes I see them. I really like the idea of using the salsa on sauce for grilled meat, poultry and fish. Hi Amira, if you and your kids haven't had this, bet you'll love it. :-) Thanks for the comment. Hi Evelyne, roasting the chilies would indeed be a good idea -- and when I use Hatch or Poblanco chilies I usually do that. Thanks for the comment. Hi Kelsie, we really like this dish, too, and rarely make it for some reason. Our loss, because it's SO GOOD! Thanks for the comment. Roasting must have brought out the best flavour of tomatillos. Your salsa verde looks outstanding with perfect texture. Dips and salsas have grown on me over the years. Gotta try yours... although carefully because I got the impression it would be a non stop eating. Hi Anglie, we like salsa verde made any which way, but we think it's best with roasted tomatillos. :-) Thanks for the comment. Hi Denise, pretty hard to stop with this once you start, you're right! :-) Thanks for the comment. Hi Raymund, this is wonderful on grilled meats! Thanks for the comment. Ohhh, I'm going to have to explore your salsa recipes, John. I make a lotof them too and have been mulling over a peach salsa today. This looks so fantastic - I have to try it! I want it on a beautiful flank steak too! Thanks for a great recipe! Homemade salsa is one of my favorite easy, healthy recipes. I have yet to make salsa verde or work with tomatillos, but now I can't wait to as soon as I can find some. You know, you can't beat chips and a good dip and this one looks killer! 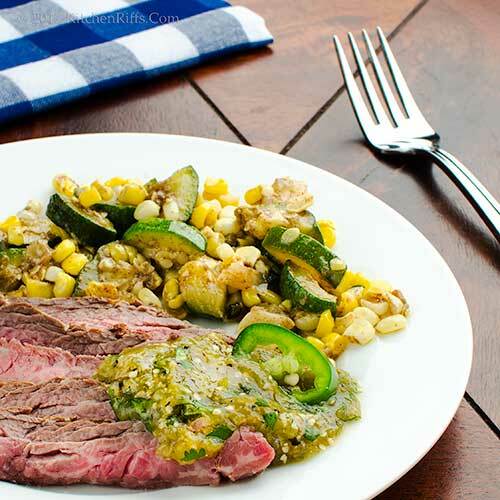 Hi Robyn, this salsa on flank steak is terrific! Really nice combo. :-) Thanks for the comment. Hi Laura, once you play with tomatillos, you'll wonder why it took you so long! Thanks for the comment. Hi Emma, it IS killer. And its flavor will slay you. :-) Thanks for the comment. Oh how I love a good salsa verda and you've certainly made one here John. You know, I usually use raw tomatillos in my salsas but I'm always seeing them roasted. Guess it's time to give that a try. This salsa verda would have gone great on a Three Sisters dish I made the other night. Next time...YUM! Hi Liz, good thing we like both! :-) Thanks for the comment. Hi MJ, although we really like to roast our tomatillos for this dish, it's also good when you don't. And of course it's easier when you don't. But we really do like the flavor of roasted things, so there's that :-) Thanks for the comment. Hi Greg, I should try that and really let the tomatillos turn totally black next time I make this. Sounds good. :-) Thanks for the comment. I love all your kitchen notes - you make your recipes so easy to understand. Very nice salsa and it looks fantastic! I could eat this on my morning eggs! I am a salsa fan. It has a wallop of flavor and not very many calories unlike a lot of sauces and gravies. What's cool about this post is I had NO idea that you were THE King of Salsas. Wowzer! Made my day! Salsa Verde as a dip, ya know I have never thought to enjoy it this way, only ever on meat. You are genius John, genius. 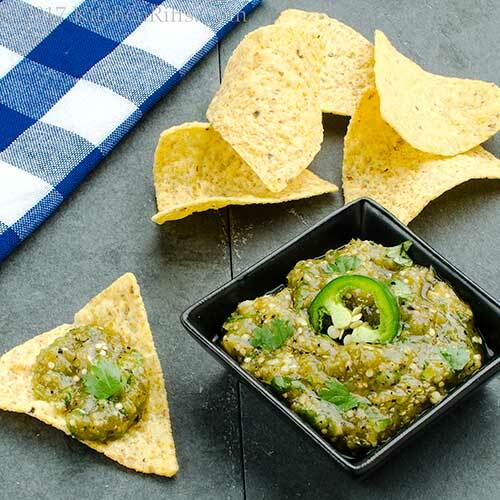 I adore the tang of salsa with tomatillos! Such a refreshing alternative to classic tomato salsa! Hi Tricia, this is wonderful on eggs! In fact I almost took exactly that picture. :-) Thanks for the comment. Hi Carol, we like salsa, so make it a lot. :-) Thanks for the comment. Hi Anna, dip, sauce, it's all good. :-) Thanks for the comment. Hi Deb, tomatillos really do have nice tang! Love 'em! Thanks for the comment. This salsa sounds very interesting. Looks like it has the perfect punch and flavors. Love us some verde sauce! Great recipe and thanks for sharing it! I love this over fish. I hate to start eating with chips since I can't be trusted to quit. Hi Shibi, this has terrific flavor! You'd like. :-) Thanks for the comment. Hi Mimi, aren't tomatillos good? Shame on your husband! :D Thanks for the comment. Hi Debra, so many great green sauces out there (and in so many different cuisines), but this is my favorite. Thanks for the comment. Hi Madonna, this is wonderful with fish. Or meat. Or chicken. Or, well, chips. :-) Thanks for the comment. This looks incredible. I've never made fresh green salsa.. love this recipe. So Simple but green tomatillos are so hard to find. John, I was glad to see a photo with steak because that is exactly what I thought of when I saw the recipe headline. Absolutely delicious! I saw very fresh tomatillos at the store and thought of what I should make with. This might be the perfect one to buy them. Looks great! Hi Nisha, isn't this nice? And really easy, as you say. Thanks for the comment. Hi Judy, this is wonderful with steak! Thanks for the comment. Hi Holly, the flavor of tomatillos is wonderful in this dish! Nice and tangy. :-) Thanks for the comment. I haven't made a salsa verde since I taught classes at Viking Culinary Arts Center in St Louis and that has to be more than 8 years ago. Yours looks delicious and reminded me how tasty it is. Looking forward to trying your version. Hi Vicki, this is good stuff, isn't it? And easy to make -- bonus! :-) Thanks for the comment. Hi GiGi, raw cabbage sounds rather good with this! Thanks for the comment. Sounds a great dish to server at my next summer party. Love the taste tomatillos and I definitely need to cook with it more. Will try this recipe out as soon as I get my new food processor. Thanks John! 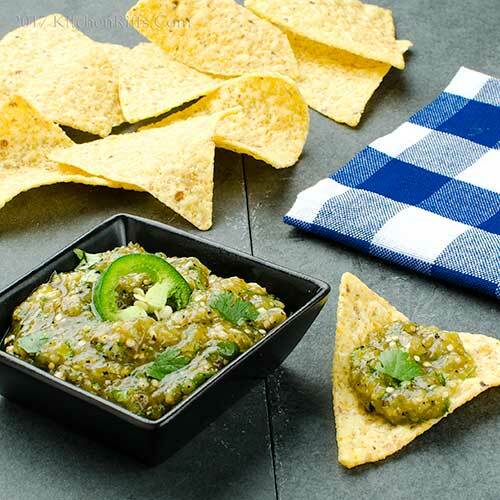 Loving this tomatillo salsa on grilled meets. The little bit of acid and heat is a perfect compliment. Hi Yi, you could make this in a blender or chop everything by hand, but a food processor is definitely the easiest way to make this. Thanks for the comment. Hi Bobbi, this is terrific on grilled meats! Or fish. Or with chips. Or heck, just eat it by the spoonful. :-) Thanks for the comment. I love salsa verde, it's my favourite! Tomatillos are so delicious. Hi Caroline, isn't salsa verde wonderful? Love its tangy flavor! Thanks for the comment. I LOVE salsa verde. It looks terrific! Hi Pam, we love salsa verde too! Such a nice flavor. :-) Thanks for the comment. I have all these tomatillo plants and no tomatillos. Figure that one out! Love a good green salsa-one can never have too many varieties! Thanks John-just in time for end of summer picnics! Hi Abbe, it's good they have these things called stores so you can get some tomatillos since your plants didn't produce this year. :-) Crazy that it's already the end of summer, isn't it? Thanks for the comment. I can remember the first time I tasted salsa verde, though it was many years ago. It's one of the most delicious things to come out of the Mexican kitchen. Hi Frank, salsa verde really has seductive flavor, doesn't it? SO GOOD! Thanks for the comment. I could probably eat my weight in this salsa, it looks wonderful! Hi Chris,that sounds like a worthy ambition. :-) Thanks for the comment. 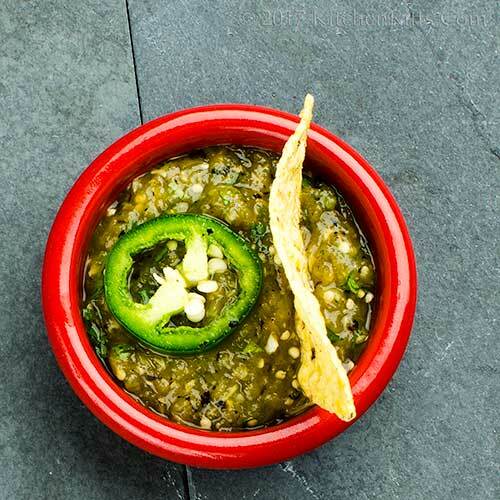 This salsa is pure perfection, love the color and the fact that you roast the tomatillos. Hands down a household favorite around here! Hi Cheri, love roast tomatillos! Such good flavor. :-) Thanks for the comment. What a gorgeous salsa verde, I have never cooked with tomatillos and now want to! Love the idea of roasting them. Hi Eva, roast tomatillos have a deeper, richer flavor than the raw, IMO -- definitely worth a try. Thanks for the comment. I could definitely see this tasting wonderful, drizzled over grilled fish or shrimp. Love that fresh tangy bite. Hi Carolyn, haven't tried this with shrimp! Gotta do that. :-) Thanks for the comment. Love, love, love salsa verde and this recipe looks delicious! I take the green stuff over the red stuff any day of the week. And homemade is even better. Hi Pamela, we like both the red and the green. Nice to have choices. :-) Thanks for the comment. I knew I should've picked up tomatillos at the store yesterday! Must try. The side in the pic of zucchini, corn, and maybe onions ? looks so good. Can you share a recipe? I do have those on hand!! Thank you! Hi Susan, you must try this. :-) The side is a variation of a zucchini stir-fry that we make a lot -- here's a basic recipe: http://www.kitchenriffs.com/2017/07/zucchini-and-chickpea-stir-fry.html We dropped the chickpeas in this version, and added the corn. Probably changed the spicing, too, although I don't remember what we did. :-) Thanks for the comment. Looks and sounds good, John! Now I will be looking for tomatillos. I haven't made anything with them for a while and this would be a hit here. And maybe the more garlic, the better. Thanks for the recipe and have a wonderful week! Hi Pam, it's hard to have too much garlic, isn't it? :-) Thanks for the comment. I love eating salsa verde. I grew tomatillos last year and we made salsa verde with them. Your recipe sounds yummy!! Hi Dawn, salsa verde has such a great flavor, doesn't it? Love the stuff. :-) Thanks for the comment. I've been eating this for years, never stopping to think what it's made of! We love salsa verde and roasting makes it even more delicious! Hi Jeff, you should try making your own sometime -- real eyeopener --its flavor is so fresh. Thanks for the comment. Hi Amy, I like salsa verde when you don't roast the tomatillos, but agree roasting is the best way to go. :-) Thanks for the comment. Hi Marcelle, it IS super good! :-) Thanks for the comment. Hi Taruna, I've never had tomatillo chutney, but it sounds fabulous! Gotta try that. :-) Thanks for the comment.